Dairy-free Cinnamon Roll Coffee Creamer – a rich and creamy dairy-free coffee creamer that tastes just like a cinnamon roll in your coffee cup! 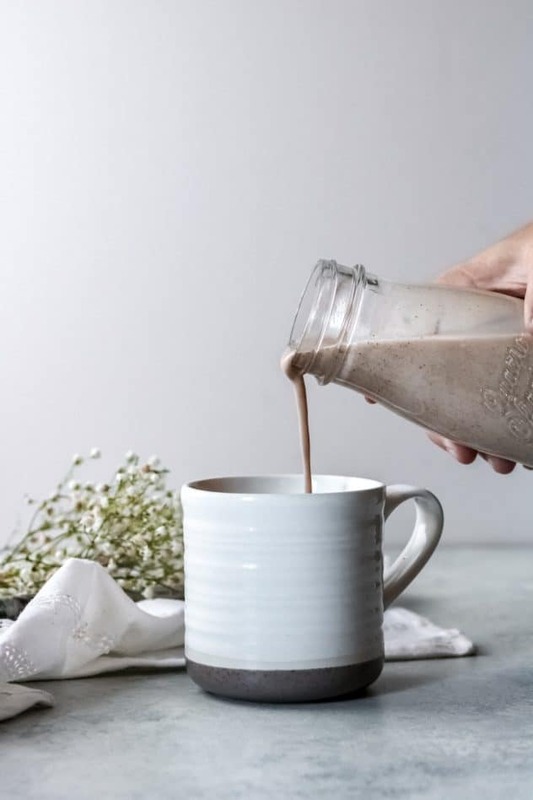 Finding dairy-free alternatives (that are also nut-free) can be a challenge – that’s why we’ve also collected all of our favorite dairy-free coffee creamer recipes into one spot! From classic vanilla bean to cinnamon to creamers made with coconut oil – you’re sure to find one you love! A cinnamon roll coffee creamer that’s dairy-free? Sign me up! This rich and creamy coffee creamer is bursting with cinnamon flavor. I’ll admit, I love my flavored lattes but unfortunately, my body doesn’t love them. I can tolerate small amounts of dairy (with minor consequences), however, rich and creamy lattes and flavored coffee creamers just don’t seem to jive well with me. So for those of you who also cannot tolerate dairy well, this creamer is for you! 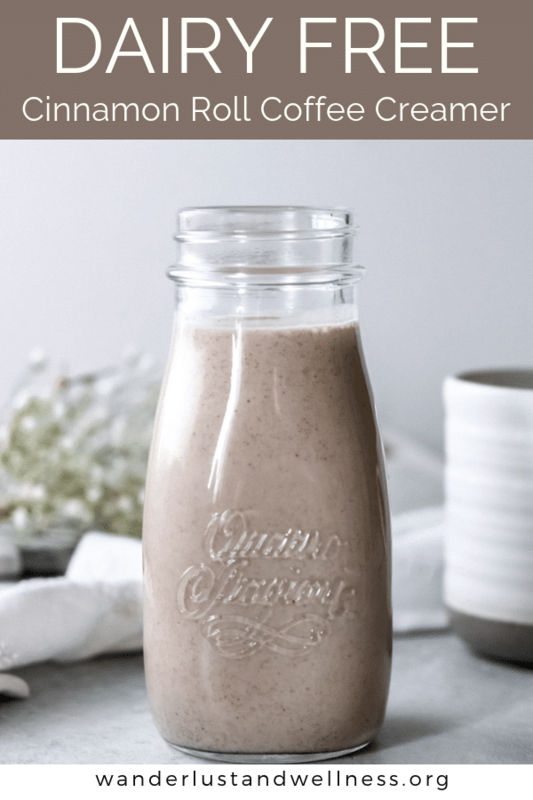 Just like with my Paleo pumpkin coffee creamer, this dairy-free cinnamon roll coffee creamer uses coconut milk as the dairy replacement. Canned coconut milk is thick and creamy and makes the perfect coffee creamer. Store-bought coconut milk creamers tend to be watery and leave my coffee lifeless. With full-fat canned coconut milk, you get a rich, velvety result. What if I can’t find canned coconut milk? Most grocery stores carry canned coconut milk these days. However, if you’re unable to find canned coconut milk you could also use canned coconut cream. Bottle coconut milk is much thinner and won’t warrant the same results. Or, if you’re an Amazon user, you could always order your canned coconut milk from there. How long does homemade coffee creamer last? You can store your homemade coffee creamer in an air-tight container, such as a mason or milk jar, in the refrigerator for up to three weeks. Do I need a milk frother or any special kitchen tools to make homemade coffee creamer? Not necessarily. I always like to blend my coffee with either a milk frother, immersion blender, or even throw it into a full-size blender with a scoop of collagen, however, none of those are absolutely necessary. I find that it creates a more velvety texture – similar to a latte when you do blend them together. How do I store homemade coffee creamer? You’ll want to store the coffee creamer in an air-tight container – such as a milk jar or mason jar. It will also need to be refrigerated as well. In a small saucepan, combine all ingredients and bring to a low simmer over medium heat, stirring until well combined. Once it comes to a simmer, reduce heat to low and let cook for 20 minutes. Transfer to a mason jar and let cool. Once cooled, store in the refrigerator. Wanderlust and Wellness participates in the Amazon affiliate program. Please see my affiliate disclaimer. Enjoy these other dairy free recipes! 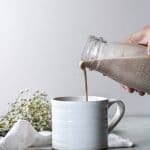 This homemade dairy-free cinnamon roll coffee creamer is heavenly – tastes just like a cinnamon roll in your cup and made with just a few ingredients. You can replace canned coconut milk with canned coconut cream. Thanks, Aleta! Coconut milk is the best non-dairy option for me, especially having a nut allergy.